As the surprisingly hot summer days seem to be drawing to an end I was reminded that my great-grandfather used to decamp his family to Scotland to escape the London heat. One of his daughters, my great aunt Gladys, was an enthusiastic photographer and I have some of her albums from those summers. The family rented a large house in Kilmacolm just outside Glasgow. In 1970 Auntie Glad took me, my mother and younger brother on holiday to Dunoon to see the places she had loved so much as a young woman. One day we went to Kilmacolm and stood on the village green to look at their holiday home, a double fronted Victorian villa. From here she, her sister and their older brothers explored the countryside. In an album entitled “my first attempts at photography” are family photos. 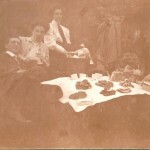 The family has been joined by the wives of the two brothers, Gertie and Maud but only Arthur (John Arthur) the older brother appears in the photographs. Perhaps my grandfather is working away and that accounts for Maud’s rather sad expression in the few photographs she features in. The boys both married in London in 1910 and Arthur and Gertie sailed for New Zealand in February 1914, a year after the death, at birth, of their first child. It is possible that this album dates before their marriages as I have another called “holidays 1910” which “my first attempts” must predate this making it probably 1909. 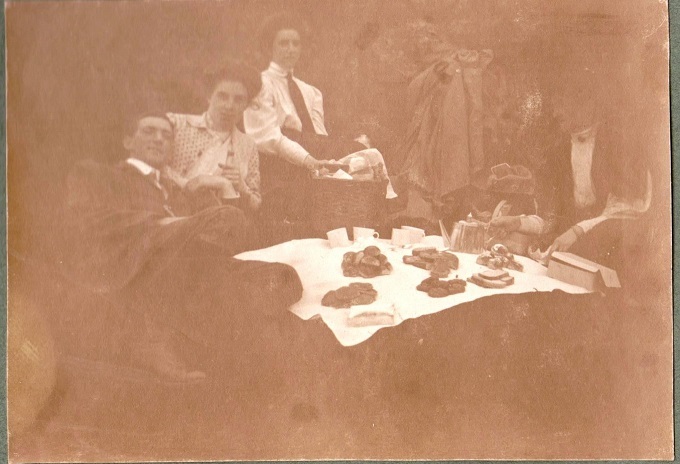 One photograph shows a picnic spread out precariously on a tablecloth on the grass and their mother, Charlotte, is pouring the tea. There is wicker picnic basket and slices of cake and scones. 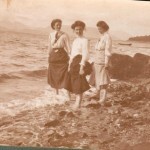 One photograph shows Ethel, Gladys and Gertie along with Mama and must have been taken by Arthur, in this photograph he has replaced Gladys and lies against Gertie’s shoulder. 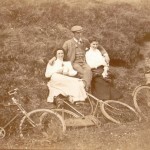 They were accomplished cyclists and used their bikes to journey further afield. 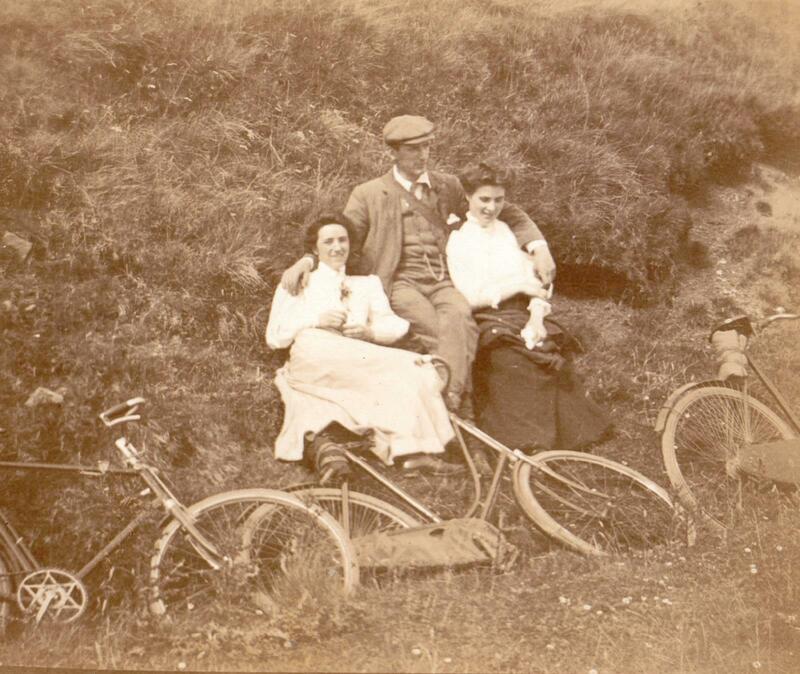 In one picture taken at Loch Thom Arthur sits with his arms round Ethel and Gertie surrounded by their bikes. 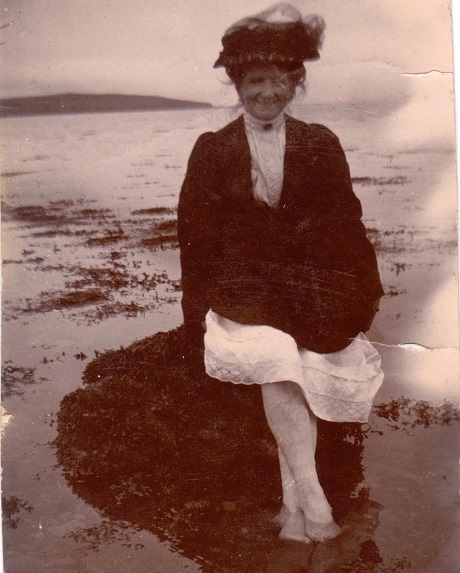 There are photographs of Dunoon where Maud has joined the party and the Gryffe with Arthur fishing, Loch Loskin with Laddie the dog and Arthur placing stepping stones at Innellan. 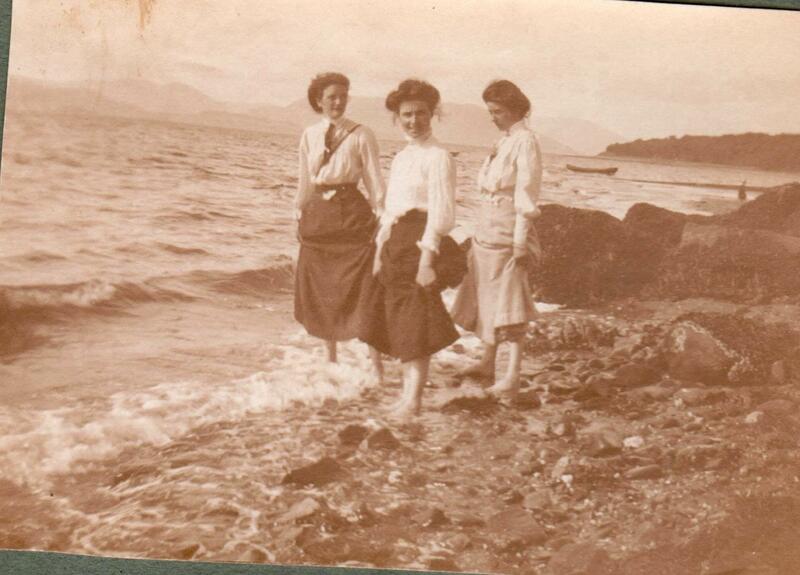 The girls are shown paddling at Inverkip , skirts pulled up above their ankles and at Ettrick Bay Mama sits boldly dangling her bare ankles in the cooling water. I have other copies of this photograph including one she sent to my grandfather, on the back she has written “only for you and Maud to see this isn’t it shocking”, this makes it one of my favourite family photos. All together an idyllic summer. What a lovely piece Barbara – oh the joys of summer! Holidays are the very best of times for family photos – you are so lucky to have these and know your ancestors enjoyed some very good times.